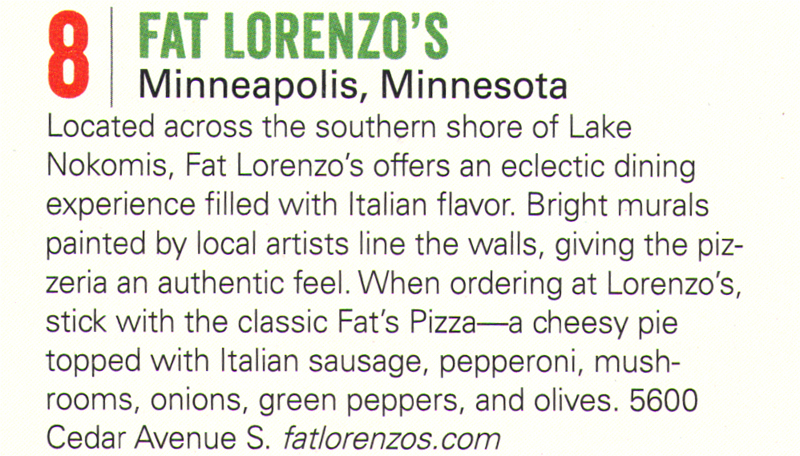 Fat Lorenzo’s named one of the best pizzas in the U.S. by Cooking with Paula Deen Magazine! 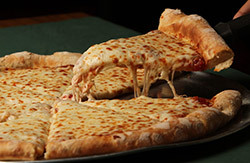 …25 years of practice has solidified Fat Lorenzo’s as one of the best in the Minneapolis pizza scene. Is there a Minneapolis pizza scene? After stuffing my stomach with all kinds of Italian goodness I thought to myself – why do I ever order Domino’s when this is available? 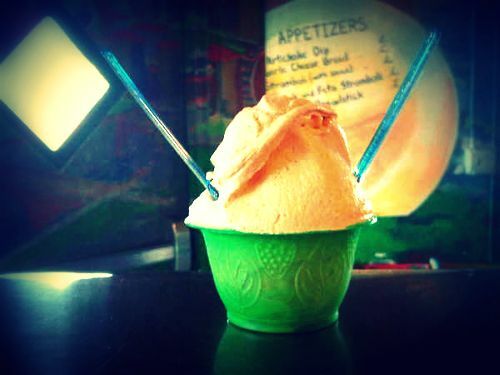 …I would definitely recommend going to Fat Lorenzo’s for pizza and a beer and then taking your gelato for a walk around Lake Nokomis. 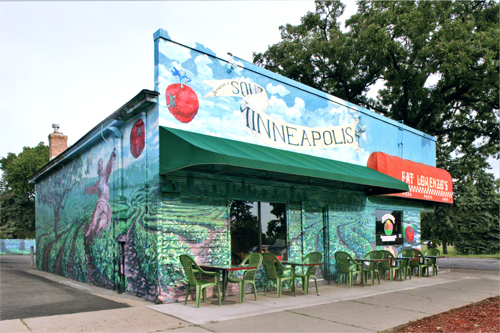 With its colorful murals and delicious pies, Minneapolis’ Fat Lorenzo’s, the original and a “standard for the Twin Cities,” is a unique dining experience that’s tough to match. As its motto goes, it has been “Italian in a big way,” proud of serving its New York-style pizza since 1987. While the restaurant offers great pies including the Fat’s (Italian sausage, pepperoni, mushrooms, onions, green peppers, black and green olives), the Alfrenzo (with Alfredo sauce, chicken, artichokes, roasted red peppers, spinach, ricotta, mozzarella, and provolone), and even the New Haven (inspired by Connecticut’s famous clam pizza, theirs is topped with baby clams in a rich herb sauce and finished with asiago). 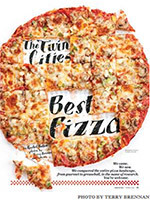 In fact, Minnesota Monthly just noted it among the 12 Best Old School Pizzerias in the Twin Cities). But when asked, Fat Lorenzo’s named their classic cheese pie as one you can’t beat, and this year’s panel agreed. Fat Lorenzo’s reputation centers around its hearty, meaty pies and colorful murals of flying tomatoes and cherubs. It’s lesser known for being one of the few spots in town to find a New Haven–style clam pizza, which tastes as if it were FedExed from the coast. If seafood on pizza isn’t your thing, there’s always hazelnut gelato. 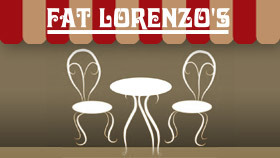 For voting Fat Lorenzo’s Best Pizza and Best Italian 2012 Readers Choice Awards, Bloomington Sun-Current. Special thanks to JRN @ The Heavy Table for the November 5, 2010 article in USA Today.